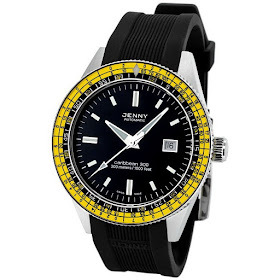 DOXA’s sister brand, JENNY Watches have a special Holiday Season Offer on the Caribbean 300. Simply use the use coupon code “BFJENNY’” to get the Caribbean’s price slashed from 990USD to 590USD + 29USD (shipping). JENNY has a history dating back more than 50 years. Gustav Jenny started out manufacturing, assembling and finishing watches and watch components for established Swiss watch brands. In 1963, his son Paul G. Jenny established JENNY & Cie S.A. in Lengnau , Switzerland, and introduced their first line of dive watches. The JENNY Caribbean was soon to become the world's first 1000 meter water-resistant dive watch, patented in Switzerland under Brev. 5292/68 Triple safe. The new JENNY Caribbean 300 combines the all the historic looks of the original JENNY Caribbean 700, which made the brand so distinctive and sought-after. If you were ever on the fence, this might be the perfect opportunity to jump on a JENNY. 590USD for a Doxa - that’s a bloody good deal imo. What do you think?